I am not much of a baker myself but I do like to try to make things every now and then beyond the pies that I make. That being said, there are people I know that are much better at baking and do things a lot more extravagant than I can do. 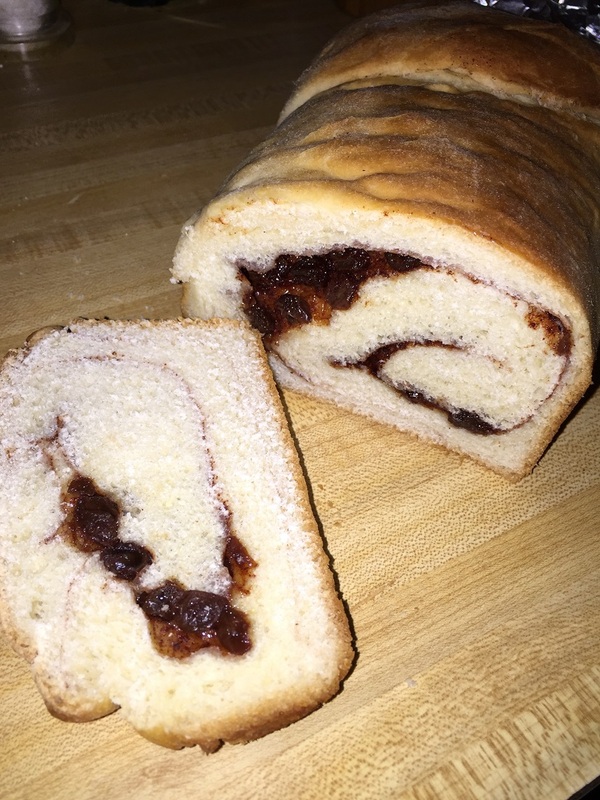 It has to be a recipe that really interests me for me to want to venture over to the baking side and make things, but it does happen now and then. That is what happened when I saw this recipe from Williams-Sonoma for white chocolate raspberry cupcakes with a raspberry butter cream. They just looked too good not to try to when I looked over the recipe it looked like something that I could actually make a pretty good go of without trouble. I actually combined this recipe with a recipe I saw for raspberry buttercream because I wanted to have a more predominant color to the frosting. Preheat an oven to 350 degrees. Line 12 standard muffin cups with paper liners. To make the cupcakes, in a large bowl, whisk together the flour, baking powder and salt.Using an electric mixer, beat together the butter and sugar on medium speed until the mixture is light and fluffy, about 3 to 5 minutes. Add the egg whites and beat until they are blended, scraping down the bowl as needed. Add the flour mixture in 3 additions alternately with the milk in 2 additions, starting and ending with the flour mixture. Beat the mixture just until it is combined. Stir in the white chocolate just until it is blended, then gently fold in the raspberries. Spoon the batter into the prepared muffin cups, dividing the batter evenly among the cups. Bake the cupcakes until they are puffed and light golden and the center springs back slightly when touched, about 25 minutes. Let the cupcakes cool completely on a wire rack, about 30 minutes. To make the raspberry buttercream, add the raspberries to a food processor. Pulse the raspberries until they become a thick sauce. Push the raspberry puree through a sieve to extract the juice and get rid of the seeds. Set the raspberry sauce aside. In a stand mixer with the paddle attachment, cream the butter on high for about 2-3 minutes to get a creamy fluffy texture. Add in the powdered sugar and raspberry sauce on low-speed until they are combined. If the frosting is too runny add more powdered sugar. If it is too thick add some milk. Spoon the buttercream into a pastry bag fitted with a star tip and pipe the buttercream onto the cooled cupcakes. Shave curls from the chunk of white chocolate and sprinkle over the cupcakes if desired or top with a fresh raspberry, if desired. The cupcakes can be stored on the counter at room temperature for a day or two and in the refrigerator for up to 5 days. I admit it was a bit of work to get the raspberry sauce through a sieve to get all of the seeds out but the hard work is well worth it to give you a smooth raspberry sauce for the frosting. These cupcakes are very tasty, with the raspberry and white chocolate shining through. If you prefer to have cupcakes without a whole raspberry inside, you could certainly take the whole raspberries and make a sauce from them and then pipe it into the center of the cupcakes so you get the raspberry flavor without the whole raspberry in there, but I liked it with the raspberry inside. I think they came out well and tasted better being in the refrigerator where the buttercream firmed up and had a great texture. This makes a great summer dessert as an alternative to making a cake or pie. The mantra for me right now has been busy, busy, busy. It seems like every time I might have an easy day coming up something pops along to disrupt it. I guess it’s a good thing when it’s work because it at least means I am staying busy instead of trying to scrounge around for more work. Anyway, all of the busy days means trying to find fast and simple dinners more and more, especially when Michelle is away and it is just Sean and I for dinner. I try not to do takeout dinners if I can avoid it, which makes dinners like this one great because they are easy to do with just a few ingredients and cost less than getting fast food, pizza, Chinese or going to some other casual restaurant. 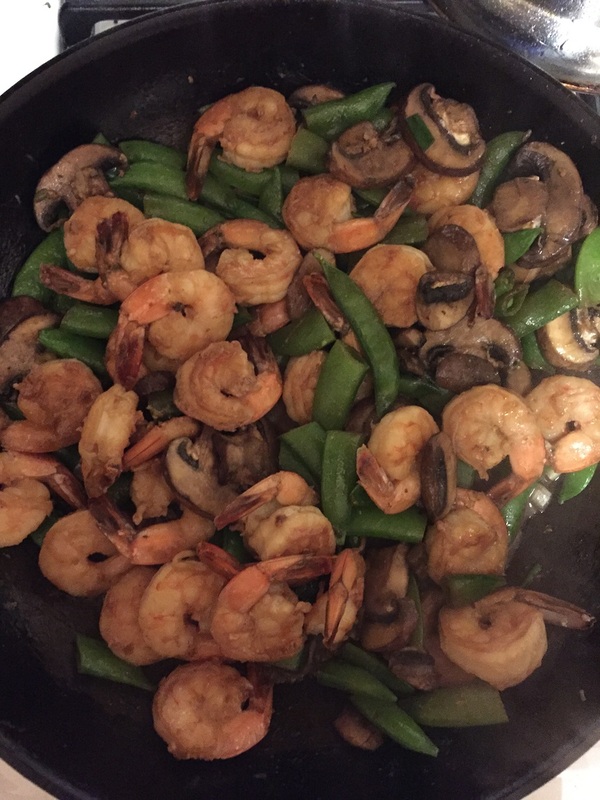 This recipe is from Williams-Sonoma and is for stir-fried shrimp with snow peas and mushrooms and makes use of really basic ingredients and is done in under twenty minutes, including time to make some rice to go with it. In a non-reactive bowl, combine the shrimp, sesame oil, soy sauce or tamari and 1 teaspoon of salt. toss the ingredients gently to coat the shrimp. In a wok or large frying pan, heat the peanut or canola oil over medium-high heat until it is just smoking. Add the garlic, ginger and shrimp and stir-fry the ingredients until the shrimp are evenly pink on both sides, about 1 minute. Using a slotted spoon, remove the shrimp and transfer it to a separate bowl. Add the mushrooms to the pan and stir-fry them over medium-high heat until they are softened, about 3 to 4 minutes. Add the sugar snap peas and stir-fry until the peas are a bright green, about 1 to 2 minutes. Add the green onions and the rice wine or sherry. Cover the pan and cook until the snap peas are crisp-tender, about 2 to 3 minutes. Return the shrimp to the pan and stir-fry the shrimp just until they are heated through, about 1 minute. Garnish the stir-fry with the cilantro leaves and serve with the white rice. It is a great, fresh dish that comes together very quickly. Shrimp cooks very quickly when you stir-fry it so you want to watch it carefully so you do not overcook it and make it rubbery. The sauce gives some great flavor to the shrimp and the simple mix of the snap peas and mushrooms are all you really need to round out the dish. Sean and I both really enjoyed it and I was able to have the leftovers for lunch the next day and they seemed even better after the shrimp had a chance to really absorb the sauce. I think it would be great with chicken or pork as well or even just with some extra vegetables and use the mushrooms as your main source of protein. As the snow starts to fall here as we get pummeled with the 1st blizzard of 2015 in my area of New York, I have been going through some of the recipes of things I have made lately and I realize I have a lot of side dishes that I have done recipes for that I have not posted on here yet. So I decided for this week I will post a different side recipe each day to give you some ideas of different things that you can try with your main dishes. The first one, from Williams-Sonoma, is for a roasted asparagus with balsamic glaze and lemon zest. 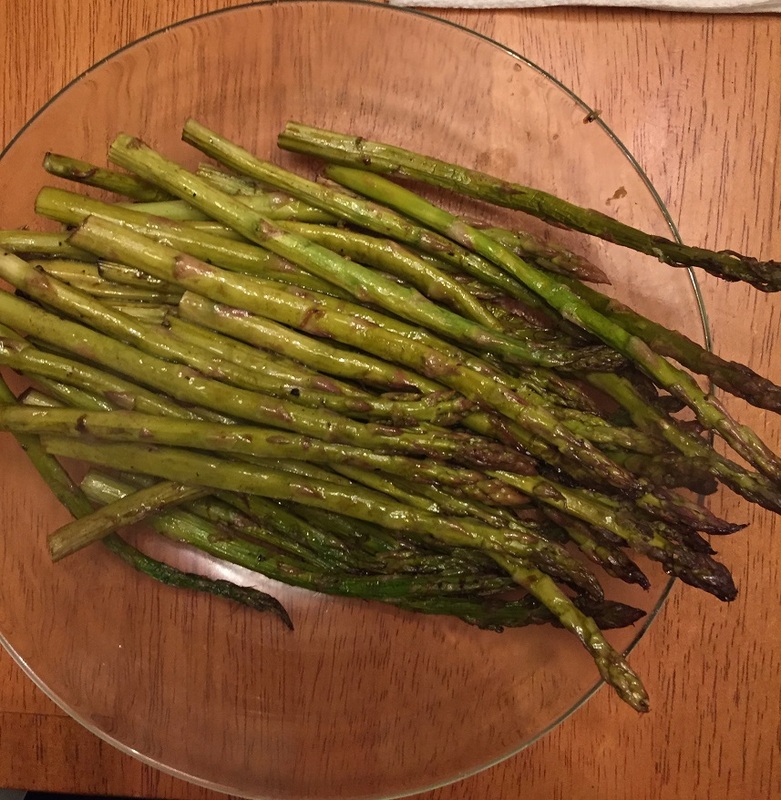 Asparagus is one of our favorite vegetables around here so we do try to make use of it quite often and I have found that roasting it is one of my favorite ways to make it. The great thing about asparagus is that you can use it in a bunch of different ways and for several different kinds of meals. This one in particular can go pretty well with just about anything and is really simple to make any night of the week. Preheat the oven to 450°. Spread the asparagus in a baking dish large enough to hold them in a single layer. Drizzle the asparagus with the balsamic vinegar and the olive oil, and sprinkle them with salt and pepper. Turn the asparagus spears several times to make sure they are all coated evenly. Roast the asparagus for 10 minutes, turning them from time to time. Remove the asparagus from the oven, sprinkle the asparagus with the lemon zest and turn the spears several times. Return the asparagus to the oven and continue to roasted until the spears are crisp-tender and the color has darkened slightly, about 5 to 7 minutes more. Transfer the asparagus to a platter and serve immediately. Or, let the asparagus cool, then cover with aluminum foil and allow it to stand at room temperature for up to one hour before serving. I find that when you roast asparagus it really brings out the great flavor of the vegetable and with this recipe the balsamic vinegar in the lemon zest really add some extra punch to the dish. I think this side dish goes really well with just about any type of beef that you might serve, but it also would work great with poultry, pork or fish. Many people often serve asparagus as part of an appetizer before the meal if you are serving a more elegant dinner or even serve asparagus as part of a brunch, and this recipe could work well for either situation. 25 asparagus spears might sound like a lot, but it really does not go very far and this recipe is perfect for 3 or 4 people. We did not even have any leftovers when I served this one myself. You can serve the asparagus warm right out of the oven or let it cool to room temperature, which is the way a lot of people like it. Personally I prefer it hot but it tastes great either way. That’s all I have for today. Check back next time for another recipe. Until then, enjoy the rest of your day, stay warm and out of the snow, and enjoy your meal! Any time that I get some shrimp Sean is always asking me to make fried shrimp. Not that I don’t like fried shrimp, I love it myself; the problem is that I hate cooking with all of that oil from a health standpoint and clean up standpoint and there are other ways to cook shrimp that I love as well. He however, has a hang up on fried shrimp so when Michelle is traveling, I very often will get some shrimp and make something for dinner (Michelle likes shrimp, but they are not a favorite of hers, so she would just as soon not have them anyway). I had seen some recipes for oven fried shrimp before but none of them ever really looked like the breading or coating held up that well or cooked well so you got a good coating on them until I saw this recipe from Williams-Sonoma for oven fried shrimp. 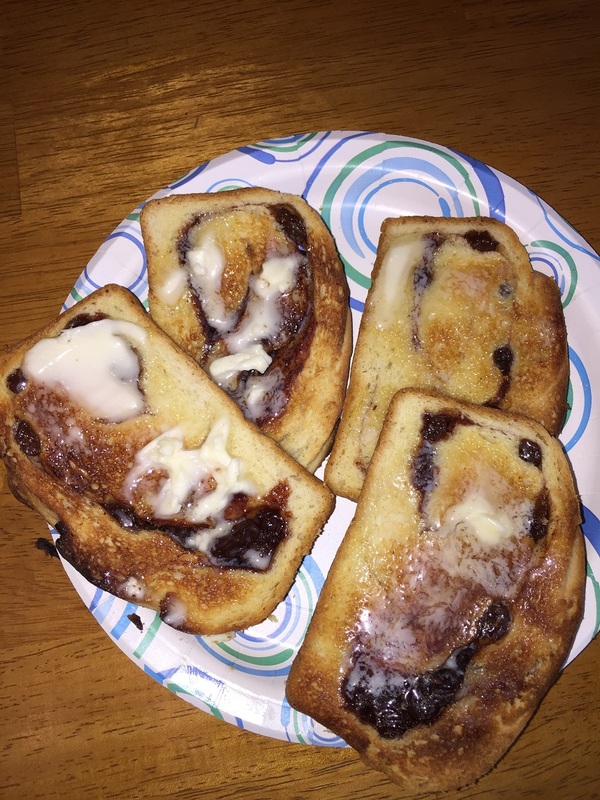 The picture looked pretty good and the recipe seemed simple enough, so I thought I would give it a try. To make the cocktail sauce, stir together the chili sauce or ketchup, the horseradish and the melon zest and lemon juice in a small bowl. Season the sauce with hot pepper sauce to taste. Set the cocktail sauce aside. Preheat the oven to 400 degrees. Lightly oil a large rimmed baking sheet. In a medium bowl, stir together the bread crumbs, paprika, oregano, basil, thyme, garlic, salt and cayenne pepper. In another bowl, mix together the melted butter and the olive oil. 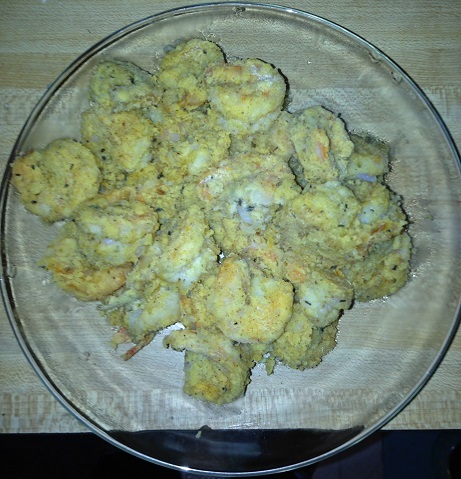 Working in batches, toss the shrimp in the butter mixture to coat it well and then coat the shrimp with the bread crumb mixture, shaking off any excess. Spread the shrimp in a single layer on the prepared baking sheet. Bake the shrimp until the coating is golden brown and the shrimp are opaque throughout when they are pierced with the tip of a knife, about 10 minutes. Transfer the cocktail sauce to individual small bowls for dipping. Serve the shrimp with the sauce on the side. This is very simple and turns out a pretty good coating for the shrimp. I used basic bread crumbs, but I think the coating would be even better with panko and will try it that way next time to see how it is. If you wanted to jazz things up a bit and make these coconut shrimp, you could try mixing in some shredded coconut with the breadcrumb mixture or even substituting it completely for the bread crumbs and following the recipe as indicated. Personally, I am not a fan of coconut myself, but a lot of people love the coconut shrimp. You can then make or buy your favorite sweet chili sauce for dipping instead of the cocktail sauce. I made this as our entrée for the meal and served it with some rice and vegetables, but it would be a great appetizer for any time. I liked the shrimp and the cocktail sauce in this one and Sean gobbled these up as well, so I think the recipe is a pretty good alternative to frying the shrimp and using all of that oil.